- Color: Sunburst Orange All colors do vary somewhat from the picture shown. Description: AMF Solar Flare will knock those pins clear to outer space. This ball is all about the coverstock with the F62 Pearl this ball is sure to go long and have a great arc into the pocket. Be sure to grab this from your bowling bag when the lanes are still oily and you will get the reaction you're looking for! Likes: I drilled my Solar Flare pin down with mass kicked 3". This ball works really well on med-dry lanes. The easily clears the heads with an arcing motion on the back.On house shot I played around 15-18 . The ball roll great with a strong move off of the spot. On sport shot had to move a little right to get the right ball reaction but when I got my feet in the spot the ball worked like a charm. Carry was very good with this ball when I went a little straighter but I was also bowling on new pins. Great ball fron AMF products. Look out, here comes the Solar Flare! This ball will strike fear in your competition, and reward you with high score after high score. The F62 cover stock allows for great flexibility in your game and also with plenty of drilling options. You want to play straight up 5? The Solar Flare will you do that. You want to swing the ball? The Solar Flare will you do that too! You want to leave corner pins and not strike? Sorry…the Solar Flare will not do that! The color that AMF picked out for the Solar Flare will make it truly stand out on the lanes. For a great all around ball to fit into your arsenal, don’t look any further than the Solar Flare. This is a ball that will not let you down! AMF's new Solar Flare is a head turner! Great looking color going down the lane. Drilled it 5 " from PAP, pin up. Good amount of skid, hard arc/flip on the backend. This ball got even better as the lanes broke down. Let me play in the dry longer than I expected. It shined once I had to move deeper. Opened up the lane and really charged on the backend. Excellent carry, this ball likes to throw pins all over the place! Great medium ball for AMF fans. Tried it with A pad on fresh and had good results. Little more up front let me play in the oil. Great job AMF! Beware of the flame...it will burn...THE PINS. The new AMF Solar Flare is quite the piece. It reads the midlane exceptionally well, while torching the backends very sharply. Get a Protocol and Hard Drive from 900 Global to compliment it, and you are tournament and league ready! This baby also has a beautiful, eye catching orange color! Looks great punishing the pocket! Ladies and Gentlemen, AMF is here! My teammate just shot 300 with it TONIGHT. Ten back, twelve times. The T-Pad (4000 grit) really gives this beast a unique appeal! Check out my videos of 900 Global/AMF Products on youtube, username "conventionalspinner".. Looking for a big move on the back end? Looking for a a ball to handle medium to light heavy oil for the THS? Look no further then the Solar Flare. If you want a "stand left and throw right ball" this is it. Cover is t-pad out the box(4000 grit) and the ball clears the heads like they are not even there. It picks up a little in the later mids but it really stores a lot for the Back ends. This ball can get angular and that is what makes it fun to watch. Apply your favorate skip/flip type layout to this ball and go to the lanes and have fun. Length: Good length, but difficult to shoot through the breakpoint. Volume: Handles all of your mediums well. Would need a cover adjustment if you are going to be primarily throwing it on heavier mediums. Type (THS, Sport Pattern etc): Great house shot ball, most of us are on house patterns that are blended well but still have an area open to the outside. The Solar Flare seeks this type of shot. On Sport, it performs well on most, but definitely not the longer heavier stuff. It does tend to pick up a little quick when the pattern starts to go away. COMMENTS: Today's do everything ball. Your 80-85% ball. It works well on most patterns and most volumes. Likes: So many balls today are made for a particular volume or certain patterns in mind. Its very refreshing to have a ball that someone can use most of the time. It stands out on all of your medium patterns, even if this wet/dry. Dislikes: The extremes are a no no for the Solar Flare, if you are on the dirt or in a flood then you should probably choose a different ball. Clean through the heads with a big back end move. Great ball for playing a breakpoint down lane. Maybe a little to strong on the backed to play up the boards unless you are a low tilt player. Works great on broken down heads or when your other balls are burning up. Best Skid Flip on the Market! Likes:I laid this ball out 5 ½ x 3 ½ x 3 ¼ from my PAP. My PAP is 5 1/8 right 0 up/down. The versatility of this ball is insane! I have used it on a variety of different conditions. This ball is so clean through the front and middle part of the pattern with so much angular motion off the end of the pattern and through the pin deck. This ball is so different than everything else AMF 300 has put out in the last few seasons. The price point is proshops in my area you really cannot beat the performance and versatility! When I need something to get around the typical track area, but not lose any down lane energy this is the ball I go to. The New AMF Solar Flare is here. Great Color! Great Price! Great Performance! I drilled this ball with a 4 X 4 layout and used it on the Viper pattern and shot 680 with it out of the box. The F62 cover stock is very flexible. You can play straight up lanes or swing the ball? The Solar Flare will cover it. 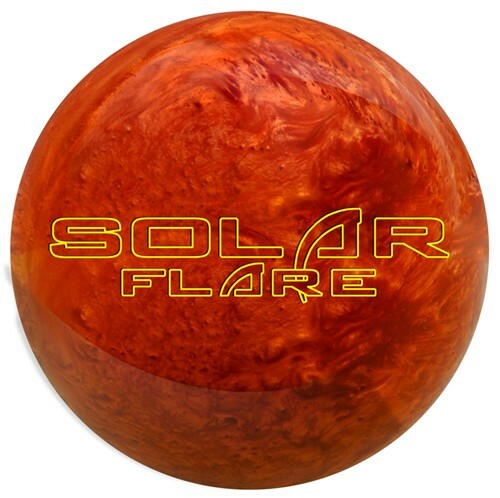 For a great all around ball to fit anybody’s arsenal, don’t look any further than the Solar Flare. This is a ball that will not let you down! About the Solar Flare: The Solar Flare is very clean through the fronts for an asymmetrical ball and makes a fairly strong benchmark type reaction. It can be played close to the track on the fresh and can be played from the deeper angles without worry of burning up. It is the type of ball that is first out of my bag as it works on most conditions and it allows me to see if I need a stronger earlier type reaction or a weaker more skid flip type reaction. This all will fit most styles and will give plenty of hook for most bowlers on a THS. The slightly weaker F62 cover on an asymmetrical core is a rare breed and will give you a stronger roll than most symmetrical cores but will also help the ball continue better than most asymmetrical balls which are generally wrapped in stronger covers which makes it a must have for most bowlers. Likes:Likes: I love this ball for league bowling. This is a great complement to the Protocol. Use the Protocol the first game then go to the Solar Flare. The ball is clean through the front part of the lane and has good energy to make the move off the spot. Once the lanes start to break down from the Protocol, switch to the Solar Flare and stay in the same area of the lane. This ball has good length. The medium/light and house patterns are right up this balls alley. The Solar Flare starts up midlane and has great hit/continuation through the pins. Don’t be afraid to get inside and let this ball work. This Solar Flare is clean through the heads with plenty of energy to turn the corner. This ball does compliment the Protocol. When the Protocol starts leaving flat tens just pull out the Solar Flare and watch the lanes just open up. Loving this ball in league! Looking for area, the Solar Flare has it with amazing drive and hitting power.